The International Raoul Wallenberg Foundation (IRWF) bestowed the “Raoul Wallenberg Medal” upon the siblings Aida and Charles Aznavour. This prestigious award is a token of recognition to the Aznavour family, mother Knar, father Mischa and their aforementioned daughter and son, who during the dark days of the Nazi occupation in France, reached-out to those persecuted by the Nazis. 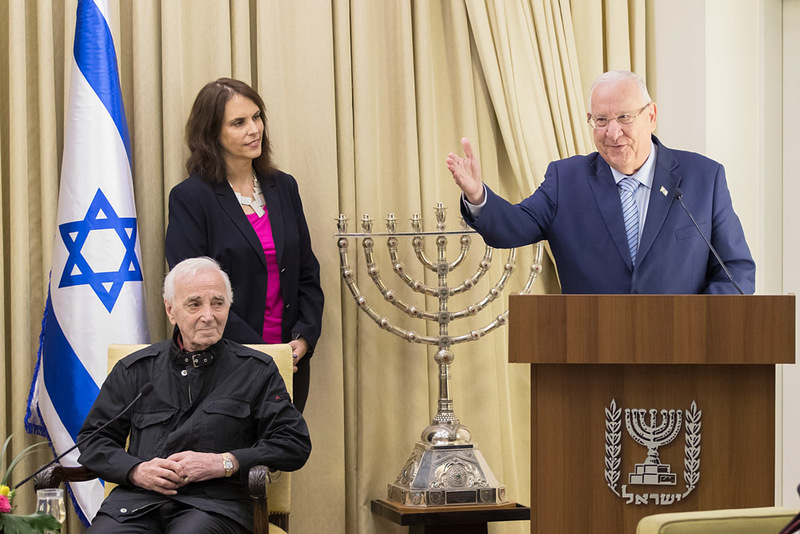 The ceremony of bestowal took place on 26 October 2017, at the Official Residence of the President of the State of Israel, Reuven Rivlin. The Aznavours were closely linked to the Missak Manouchian Resistance Group and in this context they have offered shelter to Armenians, Jews and others at their own Paris flat, risking their own lives. 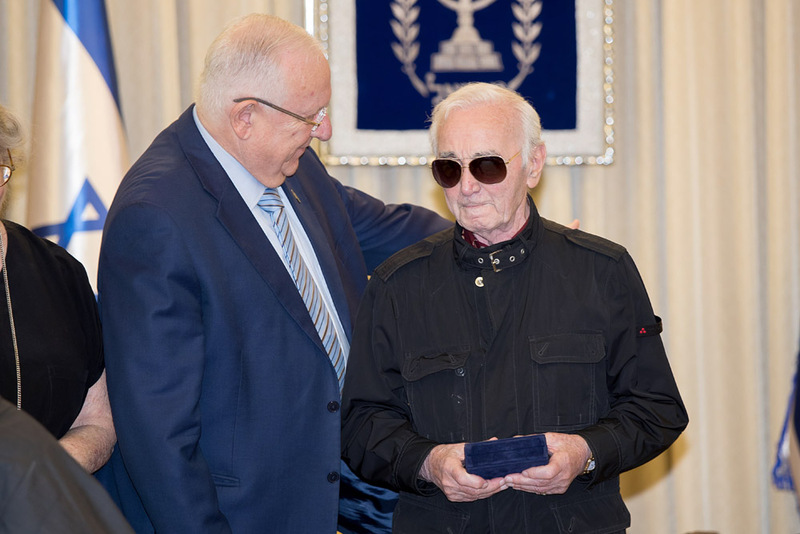 This story of solidarity and civic courage was conveyed by Charles Aznavour to Professor Yair Auron, a world-renowned Israeli scholar specialized in Holocaust and Genocide studies. Among the attendants were Helene Le Gal, Ambassador of France; Magnus Hellgren, Ambassador of Sweden and Eli Yerushalmi, Ambassador of Israel in Armenia. Abigail Tenembaum, Vicepresident of the IRWF, conducted the ceremony. 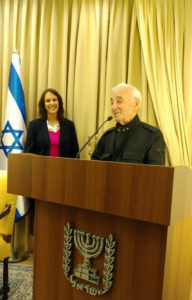 She thanked President Rivlin for hosting the event and Professor Auron for disclosing the feats of the Aznavours during the Nazi occupation, how they gave shelter to people persecuted by the Nazis, at their own Paris flat, putting the whole story in the context of the Foundation’s Houses of Life program. Baruch Tenembaum and Charles Aznavour. 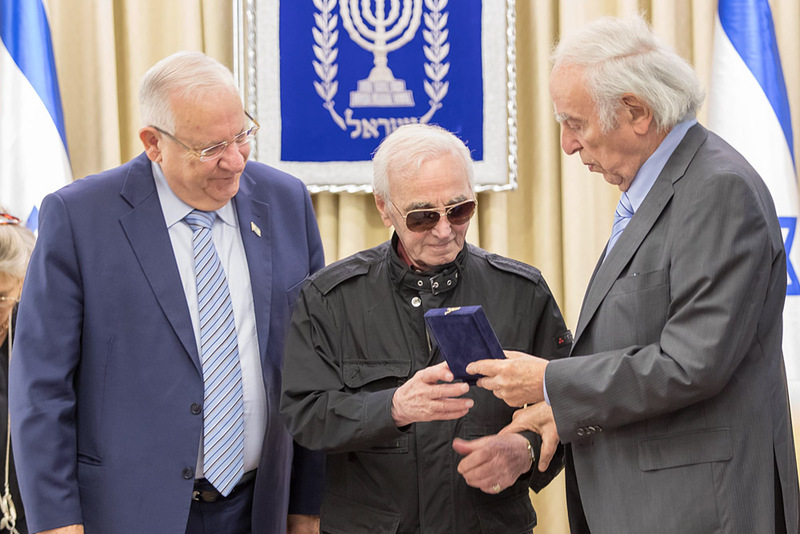 Baruch Tenembaum, founder of the IRWF, presented the medal to Charles Aznavour and, accompanied by Ariel Cohen Sabban, head of DAIA (Delegación de Asociaciones Israelitas de Argentina), bestowed the medal upon Nicolas Aznavour, on behalf of her aunt Aida. Charles Aznavour said that he always felt very close to the Jewish people and even knew the Jewish prayers better than the Christian ones. 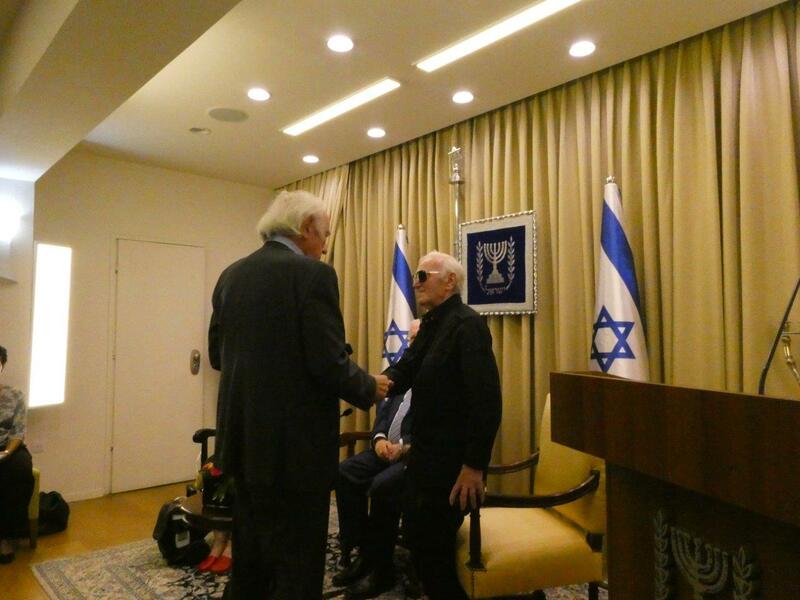 He expressed that he felt deeply honored to receive the accolade, especially in Jerusalem, one of his favorite cities. 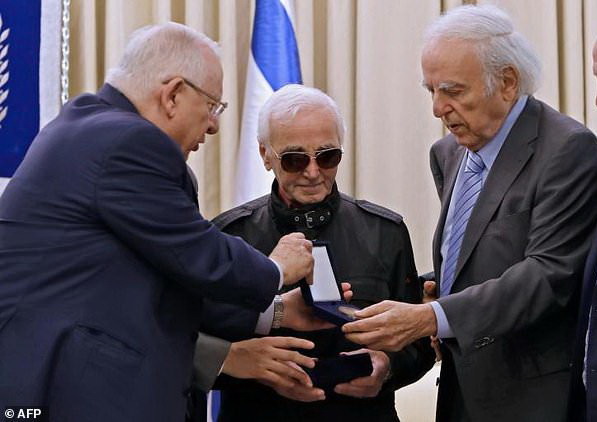 In a very candid tone, Mr. Aznavour raised the issue of the Armenian Genocide, asking President Rivlin why Israel does not officially recognize it as such. 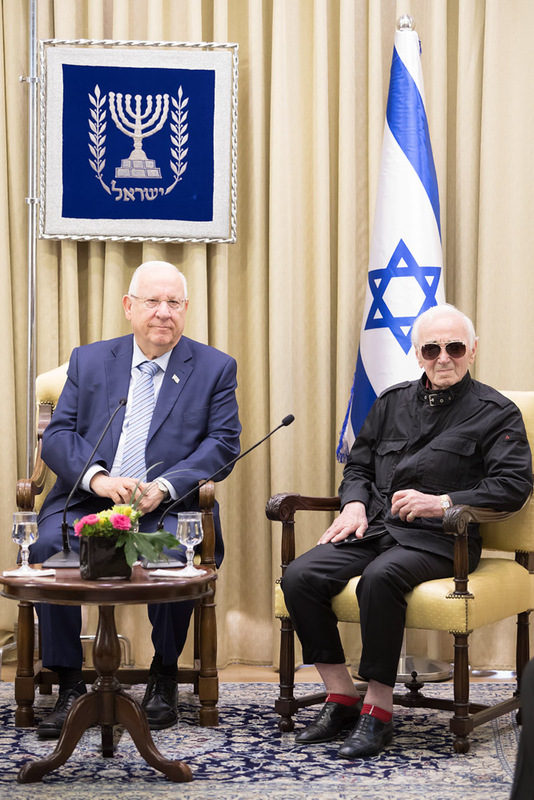 In turn, President Rivlin said how he and his wife Nechama admire Aznavour and even started their relationship listening to his memorable songs. He congratulated Aznavour on this well merited recognition and he outlined his personal commitment to the Armenian people and how he always denounced the terrible masacre that they suffered. He said that beyond any definition, it is clear what happened to the Armenian people and now, as President, he is bound to speak in one voice with the government. He remarked that “whoever saves a life saves the world entire” and the “Aznavours saved many lives”. 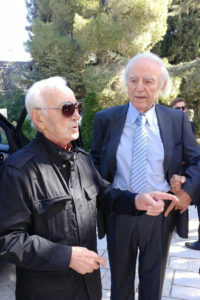 He prompted Aznavour to feel at home and added that as far as he’s concerned, “Armenians are our brothers”. “I hope you feel the same”. Aznavour nodded in agreement. 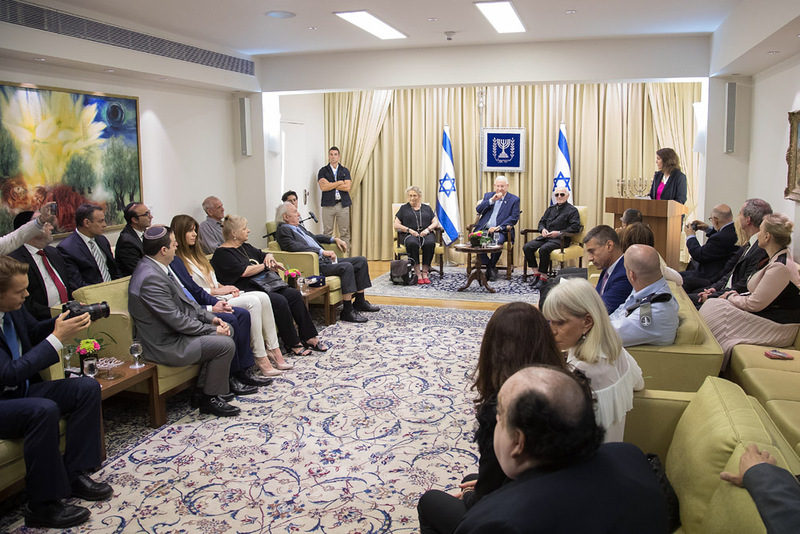 President Rivlin praised the activities of the IRWF and placed a special emphasis on the NGO’s Houses of Life program, saying that he is hearing wondering echoes about this initiative. 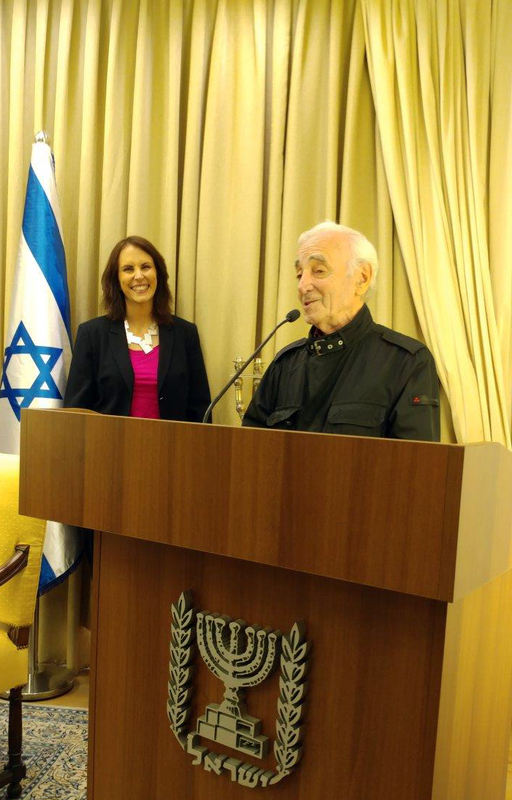 Abigail Tenembaum and Charles Aznavour.